Talks to disarm militants in the Shia Iraqi holy city of Najaf have broken down, the Iraqi government negotiator has announced. Mouwaffaq al-Rubaie said he was going to leave the city, where fighters loyal to radical cleric Moqtada Sadr have been resisting US-led forces. Mr Rubaie said the government would resume military operations against the militants - ending the uneasy truce. A Sadr spokesman blamed the Iraqi prime minister for the talks' failure. "You have to know, we had agreed with Rubaie on all points but [Prime Minister Iyad] Allawi called him back and he ended the issue," Ali Samseem told Arabic television network al-Jazeera. The BBC's Matthew Price in Baghdad says this is bad news for the Iraqi government, which knows it needs to bring about a peaceful end to the violence in Najaf. Every day the stand-off continues, Moqtada Sadr and his men gain more support across the country, our correspondent says, not only from Shia Muslims including those who do not agree with his methods, but also from Sunnis. Violence also flared up again in Hilla, south of Baghdad, and in the volatile "Sunni triangle" north-west of Baghdad on Saturday. In Hilla there were fierce clashes involving Sadr supporters and local police - Iraqi officials said that three police and at least 40 militiamen were killed. In the Sunni stronghold of Samarra, US planes carried out air strikes, killing about 50 insurgents, according to the US military. Local accounts put the number of dead at between five and 12. In Falluja, US planes bombed several houses on Saturday, killing five civilians and wounding eight others, doctors at the Sunni city's hospital said. The US military has not commented. This is by no means a full-scale national insurgency yet, even though the potential for chaos across Iraq certainly exists, our Baghdad correspondent says. Shia Iraqis from outside Najaf have been arriving in the area to offer their support to Moqtada Sadr. Mr Rubaie, the Iraqi national security adviser, said the talks with the cleric's followers had yielded "no positive conclusion". "My government thought there was no use in continuing," he said, adding that he felt "deep sorrow and regret". "Our goal was to spare blood, preserve security and for the militias to put down their weapons." Mr Rubaie told a news conference the Iraqi interim government was resuming "military clearing operations to... establish law and order in the holy city". Moqtada Sadr's Mehdi Army militia fought running battles with US-led forces for about a week before the truce. They have been concentrated on the Imam Ali shrine, where the cleric himself appeared on Friday to pledge death or victory. The cleric has demanded the withdrawal of foreign troops and an amnesty for his fighters. Meanwhile, Iraq's highest-ranking Shia cleric, Grand Ayatollah Ali Sistani, is described as being in a stable condition following heart surgery in London. The organiser of Iraq's much-anticipated national conference has confirmed that it will take place on Sunday, despite concern over the last few days that it would be delayed. The head of the preparatory committee, Fuad Masoum, said the conference would be a chance to stem the recent bloodshed and solve many of Iraq's problems. In Russia, Defence Minister Sergei Ivanov said there should be an international conference on Iraq. He was speaking at a news conference with the visiting US counterpart Donald Rumsfeld. 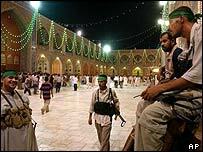 "No-one seems willing or able to bring peace to Najaf"